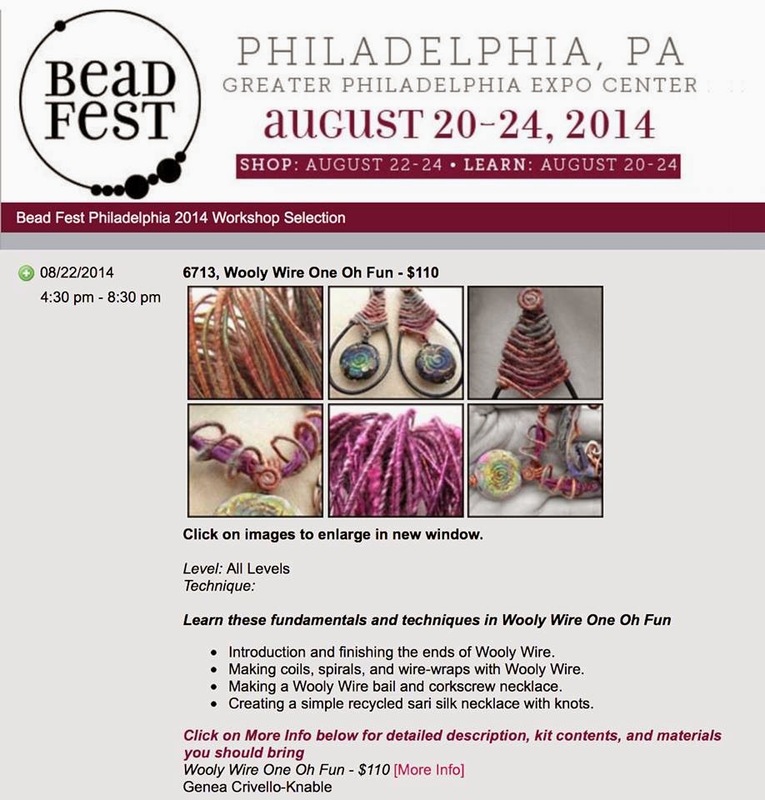 Hello friends!I am super EXCITED to announce I will be teaching my first BIG class at Bead Fest Philly in August! Not only will we be vending again this year, but I will be teaching you the secrets of working with Wooly Wire! Class is held on August 22nd from 4:30-8:30pm. Cost for class is $110 along with a special show price kit fee of $55 (valued at over $110!). You can click on the link Wooly Wire "One-oh-FUN"! to get signed up for class! You will need to scroll almost ALL the way down the page to get to the link, but I promise it's there! ;)So what will you learn in class? Well when asked most of you were pretty intimidated to pick up Wooly Wire. I want to ease your mind about working with this FABULOUS new wire! You work with Wooly Wire just like you would any other wire except it's fuzzy and colorful. You just do a little felting and tucking of the end of the wire to secure it, but it can do just about anything else you normally do with regular metal wire. 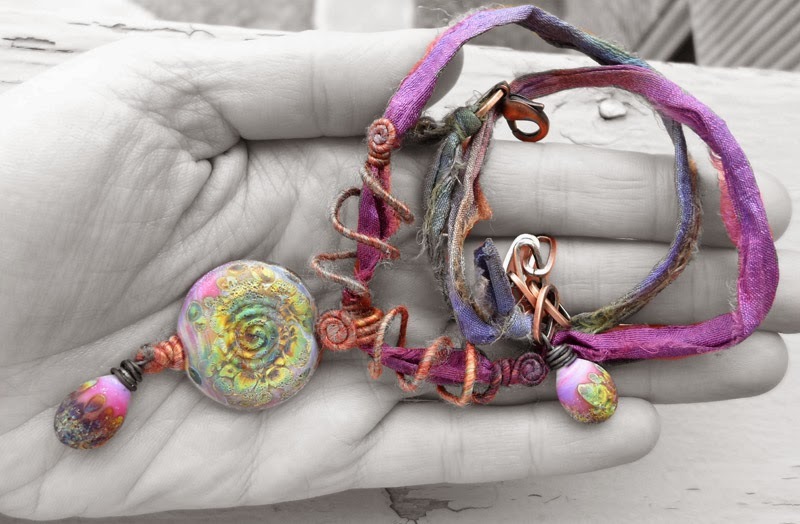 Here is a link to my "Finishing the ends of Wooly Wire and wire-wrapped bead" video tutorial.I will be teaching you to: wrap, coil, spiral, and finish the ends of Wooly Wire! 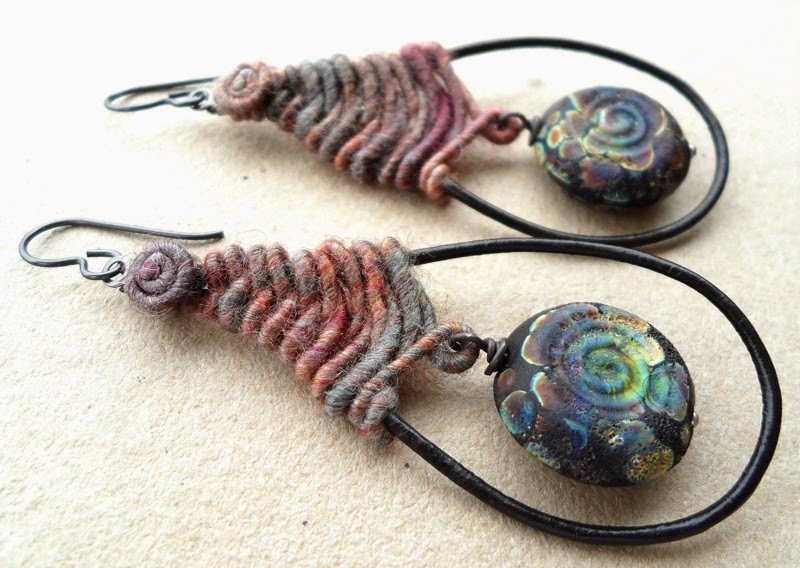 You will learn to: make a Wooly Wire bail, a corkscrew spiral necklace, and weave a pair of earrings! 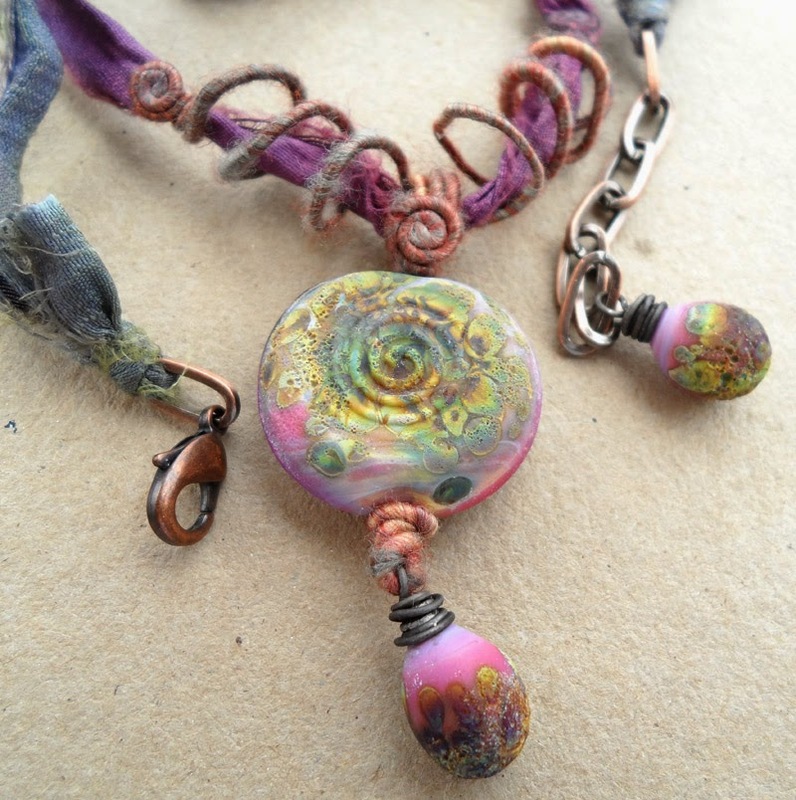 I will even be showing you how to make one of my recycled sari silk necklaces! 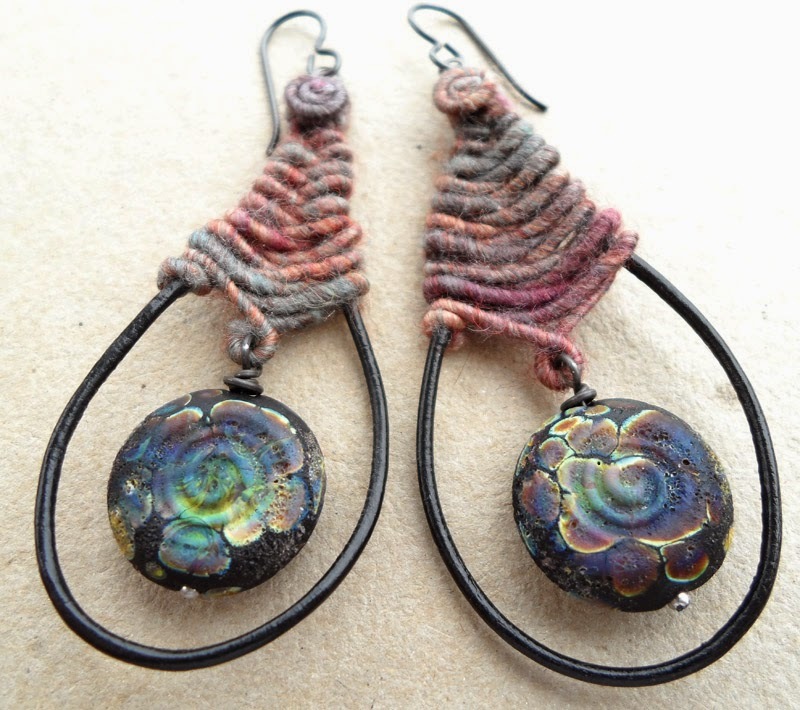 I am very confident when you leave class you will not only feel super comfortable working with Wooly Wire, but you will be ready to DIVE into pushing the limits of your design! For the class I thought you all would love working with my stone textured beads and who doesn't love that pinky purple?! I chose a simple yet funky design for the necklace. I wanted you all to learn some basic and fun techniques with an "everyday" style necklace to wear. My "Ancient Tapestry" earrings were VERY well received so I decided to also include the creation of these fabulous earrings to the class! The black and rainbow goes with just about every outfit! Delightful, no? !Well don't delay! Hop on over and get signed up now as we may fill up well before the show!I can't wait to see you there!